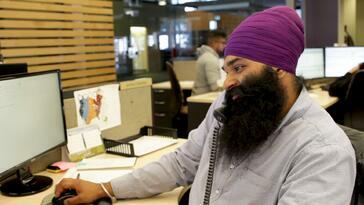 In this instalment, we meet Jaipaul Rakhra, a city fleet manager in our Mississauga terminal. He has been part of the Bison family since 2015. Prior to trucking, Rakhra worked in retail and retail management. Even though he handled products that were shipped to retail locations, Rakhra didn’t realize the number of industries trucking affects. After all, a large majority of consumer products are shipped by truck. Now, Rakhra isn’t on the receiving end of goods in a retail environment, he’s part of getting them from point A to point B. Check out the video below to see one of the many exciting roles at Bison and what happens with Rakhra’s team.